12 Amp High Voltage RapidESC is settings the industry standard for the Go-To ESC for any mini Quad on 4s. OPTO - less EMI in the multicopter frame and less heat - you get a lot of electrical noise from 4 to 8 high amp uBECs in a radial pattern at the centre of your multicopter. less heat. less chanch of failure. 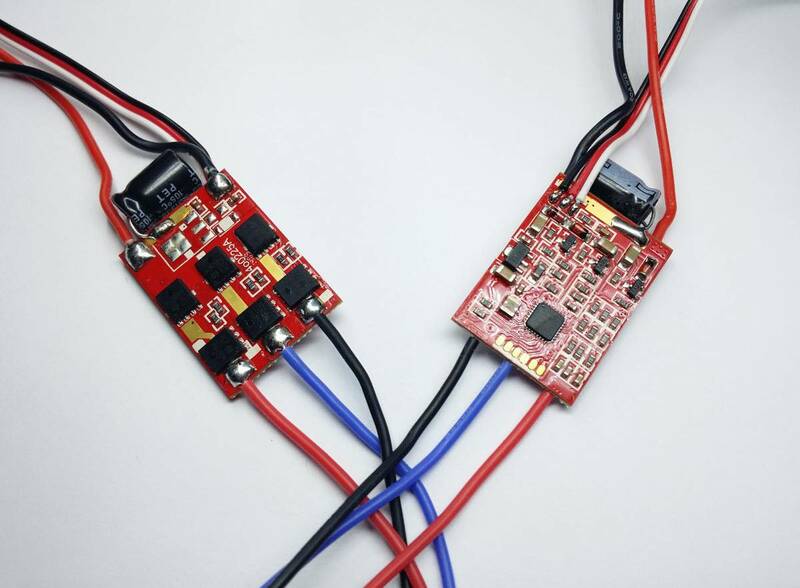 These are the optimal flash-able ESC's for multirotors. They are all flashed and freshly wrapped with Clear shrink to show off all the PCB greatness.The F-12A HV ESC's have been tested to the tee, up-to 20.5amps all day long when used with a 2208-1800kv, 6x4.5 hq prop, showing an impressive 1050 grams of thrust. **Currently we are flashing them with SimonK 5-15-13 firmware to be compatible with the Sunnysky X2204 motors, etc. These ESCs will give your multi rotor quicker reflexes, less drift, and smoother flights. These are so fast, compared to standard ESCs you can double your PI gains! ALL ESCs are flashed with the most current version of the famous SimonK firmware. Future software updates can be performed through the servo cable eliminating the need for complicated flashing jigs. Simply put the best ESC you can get for your multirotor. Flashed with the famous SimonK OpenSource Firmware for super-fast throttle response, which makes your quad more responsive and "locked in". These ESCs do not overheat, burn or lock out - unline many other ESCs flashed with the SimonK firmware. These ESCs are completely re-designed from the ground up. Flashed with the famous SimonK OpenSource Firmware for better throttle response . New firmware means direct, linear throttle response, making it suitable for multicopter use. Up to 600Hz input rate is supported, with immediate updates to motor pwm duty. Each ESC is tested with a motor before and after loading new firmware. The the external 16MHz oscillator line up exactly with the numbers in microseconds, but the internal rc oscillator ones will drift quite a bit based on temperature. The ESCs use only N-channel FETs have the advantage of lower resistance, less losses and hence more efficiency. External Oscillator:"An external oscillator may supply a more consistent timing signal and steadier motor speeds" "but the internal rc oscillator ones will drift quite a bit based on temperature. These ESCs are a revision of the nearly-perfect F20A & F-30A ESCs with high quality board layout and components to make them perfect. Do not settle for anything less. NOTE: This firmware does NOT check battery voltage or ESC temperature. Always use a LiPo alarm and monitor pack voltage while using.